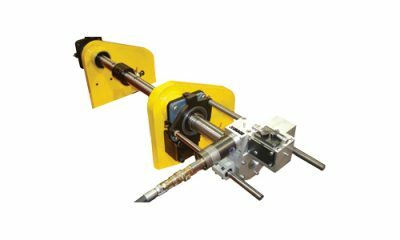 KBSS can access a line boring machine for excavator buckets, hinge pins, gearboxes and many more on site applications featuring a choice of either pneumatic, hydraulic or electric drives. A line boring machine for excavator buckets, hinge pins, gearboxes and many more on site applications featuring a choice of either pneumatic, hydraulic or electric drives. These machines have a standard 24” boring stroke, a high torque geared bar drive and features an easy use roughing and finishing feed.